Ok, this is why a small, local company with a direct link to manufacturing makes sense. 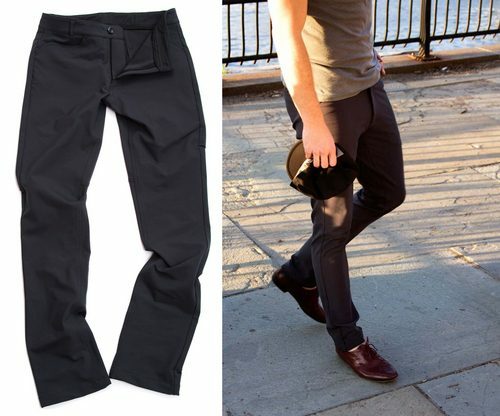 Outlier has heard your cries for a skinny cut pant and here it is! Different body types need different clothing, and at Outlier, they are out to make clothing that fits all sorts of cyclists shapes. The OUTLIER Climber pants are a full on reengineering of slim cut pants for a cyclists world. The innovative vertical yoke removes most of the traditional stress points that cycling generates in a garment, allowing for a free range of movement. The curved waistband is higher in the back to keep certain areas hidden and lower in the front to allow you to lean forward and ride in comfort. The spread back pockets are easy to access and positioned so you don’t sit on them while riding. Cut slim for comfort, form and aesthetics. Made with Outlier’s 4Season Lotus fabric, these pants have four-way stretch which allow full movement on and off the bike. Quick drying, breathable, water and grease resistant to keep you crisp and comfortable in any situation. Made in New York City and available in Black and Slate Gray at www.outlier.cc for $180.